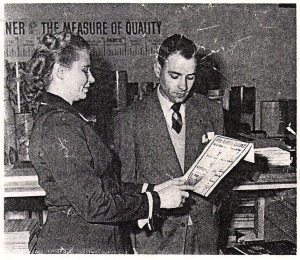 Robert W. Kiser, or Bob Kiser as most knew him, came to Memphis TN in 1949 to open a floor covering store named Linoleum City. The idea for the store originated in Decatur, IL where he was employed at a flooring company there called Miller-O'Neill. He had an opportunity to go into business with the firm in a new venture, and all that was lacking was a city in which to locate. One of the major floor covering firms of the day made a survey of Southern cities and offered several locations to Bob and his two business partners, D. Ross Miller and Bernie O'Neill. The trio formed a corporation and liked Memphis best of all, particularly a spot on North Cleveland, in the midst of one of the busiest trade areas in town. Kiser was to be in charge in Memphis while his partners operated Miller-O'Neill in Decatur. The original store opened in May 1950, and word spread quickly about the new store and the energetic young man running it. A local newspaper at the time described Bob as "an enterprising 28-year old with an eye for business, a way with customers, and a flair for the unusual in the trade." They also asked him about his physical handicap (Bob had the misfortune of losing his left arm at age nine), and he explained, "While climbing a tree near by home in Decatur, I fell out and hurt my arm. It got worse, gangrene set in and the doctors had to amputate it. But through the years I haven't found that much of a handicap, and of course, it doesn't bother me at all in my business." After a few successful years of growth, Bob bought out his two partners, and renamed the store Kiser's Floor Fashions. And from the start, Bob built the business around value, personal service, and customer satisfaction--a tradition the second and third generations proudly carry on today. "We have a policy that the customer will get exactly what is advertised and the service along with it. This policy is more necessary in business now than ever before. We guarantee everything we sell and insist that the customer is satisfied with his purchase." "All of us strive to make friends with all the people we meet. First, we want to give our customers a real dollar's worth of merchandise for their dollar. Secondly, we try to help them in every way so they will be pleased--and tell others about us." Over the next several years, buildings and locations changed, and some of Bob and Mary Kiser's eight children grew up and began working at the stores. Today, there are eleven family members and several long-time employees working at the store, and we are all dedicated to serving you in the same valued and personal way that Bob did from the very start.